Parental Skype Recorder is a unique and invaluable tool for secretly monitoring Skype conversations. The recorder starts up automatically along with Windows and is completely invisible, with no windows and no icons in the taskbar or system tray. 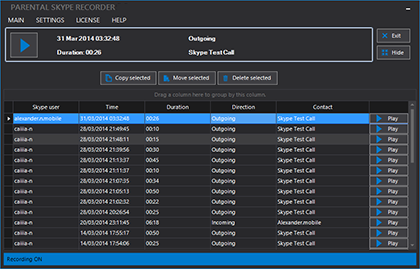 The recorder constantly monitors Skype activity. It automatically starts and stops recording so that every conversation is captured. A secret hotkey combination is used to take control of the recorder. Simply type the combination and the hidden window appears. The default combination is Ctrl+Shift+Alt+S and you can change this as desired. For additional security, you can set up a password to prevent unauthorized Parental Skype Recorder access by other users. The recorder uses the standard MP3 audio format for compact storage. Recordings are placed in hidden folders using encrypted filenames.